Jim Stacey, with beard and hat, peering into the camera, at a public function late in life. Photo courtesy of Maria Stacey. It was Tasmania’s biggest rush since the Lisle gold craze of 1879. 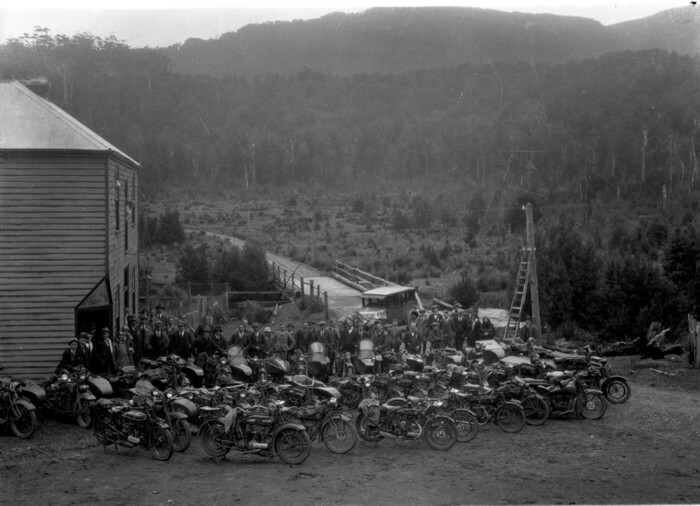 The year was 1925, the commodity was osmiridium, the place was the Adams River, 120 km west of Hobart—and the name on everybody’s lips was Stacey. Two generations of Staceys, a Tasman Peninsula family, drove the discovery and development of what became Adamsfield. Yet the story of the brothers Jim and Tom Stacey shows how capriciously fortune was apportioned to mineral prospectors. Perhaps Jim Stacey somehow offended St Barbara, patron saint of miners. For all his initiative and enterprise in the field, he made no money. His brother, on the other hand, turned up when the work was done and made a killing. Jim Stacey was born at Port Sorell on 28 October 1856 to Robert Stacey and Kara Stacey, née Eaton. As a young man, tin commanded his attention. By the age of 20 he was at Weldborough, on the north-eastern tin fields, with two of his brothers, one of whom died there from suspected exposure. 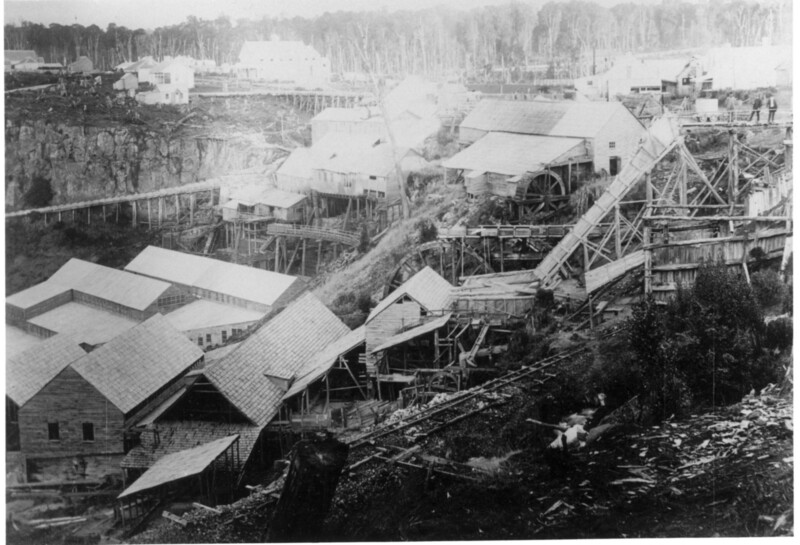 Jim Stacey then went to the Mount Bischoff tin mine at Waratah, where his mining education continued. He recalled meeting the mine’s discoverer James ‘Philosopher’ Smith, and learning from him the importance of testing river sands for minerals. Stacey benefited from meeting some of the best prospectors on the west coast—WR Bell (discoverer of the Magnet mine), George Renison Bell (Renison), the McDonough brothers (Mount Lyell), Frank Long (Zeehan) and others. The independence of these men impressed him. He was probably at Mount Lyell in 1886 during the excitement over the Iron Blow, and he later recalled testing the Franklin River for gold. 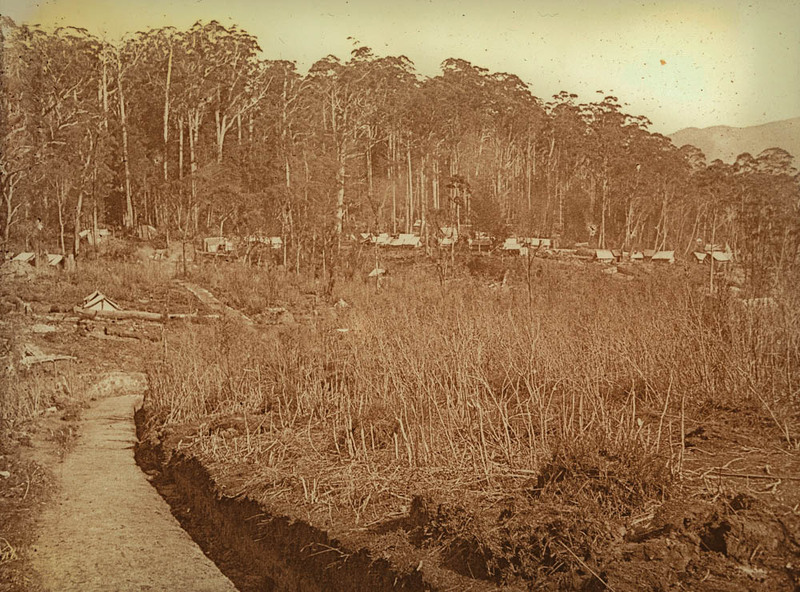 The Mount Bischoff Co and Don Co plants at Waratah, c1890, courtesy of the Tasmanian Archive and Heritage Office. While at Waratah, Jim Stacey had also married Henrietta Davis. Perhaps the couple had put away some money, because they established a farm at Nubeena on the Tasman Peninsula, where the Stacey family were now settled. 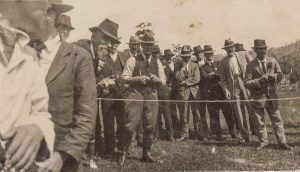 By 1907, when he was 51 years old, Jim Stacey was a respectable member of Peninsula society, being an inaugural member of the Tasman Municipal Council. Jim Stacey’s much younger brother Thomas Arthur Stacey was also a mineral prospector, but there the similarities end. Tom was also born at Port Sorell, but in 1877, 21 years after Jim. Little is known of his early years until in 1906 he married Edith Grace Wright at Koonya on the Tasman Peninsula. To say the marriage was an unhappy one would be an understatement. During World War One (1914–18), Jim Stacey was the model of patriotism, ‘sending’ five sons to the battlefields and being active in recruitment. Two of those sons were killed, another two were wounded. Other people sought an escape in the war. So it was for Tom Stacey, who must have owned the most peculiar war record in his family. He enlisted at Claremont, Tasmania, under the alias John West to avoid maintenance payments to his estranged wife and children. When the police tracked him down, he deserted, eventually re-enlisting, under his real name, at Cloncurry in outback Queensland. Stacey reached Cape Town on the troop ship Wyeema in 1918, just as the Armistice was being signed. Returned to Sydney with the rest of the 7th General Reinforcements, he was arrested as soon as he was discharged. In his sixties, Jim Stacey was reborn as a prospector. The catalyst for it was the discovery of belts of serpentine, the host rock of osmiridium, in south-western Tasmania. 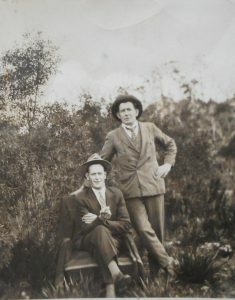 In 1924 he led a party which included Fred Robinson, Edward Noye, and his sons Sydney and Stanley Stacey to Rocky Boat Harbour (Rocky Plains Bay) near New River Lagoon. Announcing the discovery of osmiridium there, the old Bischoff man proudly asserted his independence, stating that he took no aid from the government, having first found the metal while prospecting on his own account months earlier. 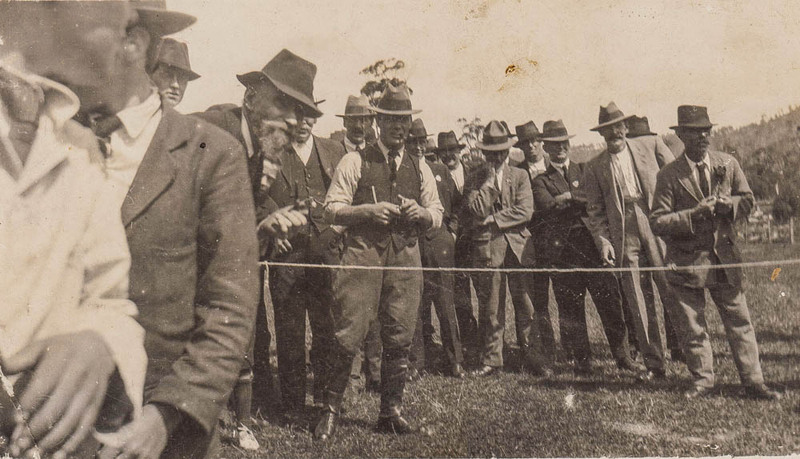 The first sale of osmiridium from southern Tasmania was in January 1925 when Arthur (AH) Ashbolt of AG Webster & Son in Hobart bought a 25-3-13-oz parcel worth £780-10-0 from Nubeena men Robinson, Noye, Jim Stacey and C Clark. In November 1924 Arthur, Sydney and Charles (‘Brady’) Stacey, plus ‘Archie’ Wright and Edward Bowden of Hobart retraced Government Geologist Alexander McIntosh Reid’s steps by working their way along the South Gordon Track to the Gordon River, then back along the Marriott Track to the Adams River Valley, discovering osmiridium on the western side of the Thumbs. Wanting confirmation of their find from the experienced Jim Stacey, they arranged to meet him at the Florentine River in February 1925. 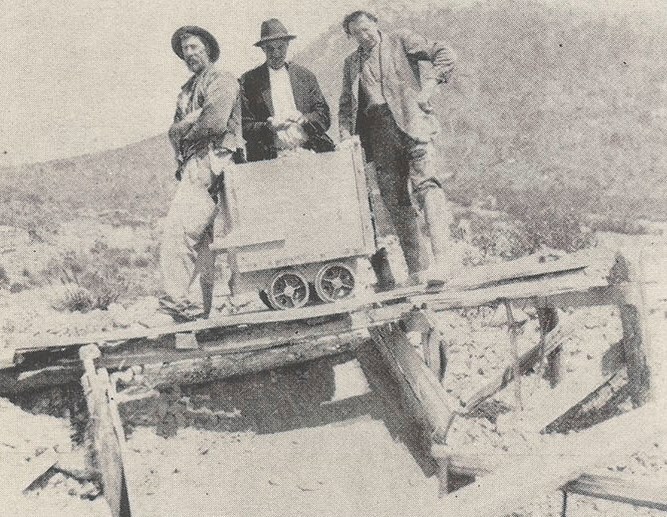 Jim Stacey and party made their own osmiridium discovery independently on a different site near the head of Sawback Creek, the eastern branch of the Adams River, 120 km west of Hobart by railway, road and sodden, steep mountain track. 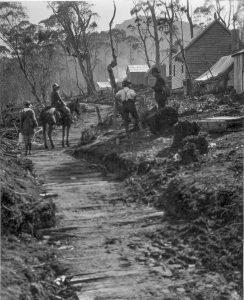 From July to September 1925, a quarterly record 1078 miner’s rights were issued in Tasmania, as diggers rushed the field. Jim Stacey was reported to have chosen his reward claim hastily, and won little from it, whereas, ironically, his brother Tom, who had had no part in the early expeditions, ended up with the best claim on the field. In the December quarter for 1925 alone, Tom Stacey pocketed £1186—the equivalent of a six-figure sum today. 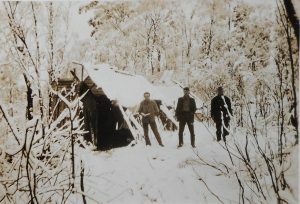 Adamsfield diggers in the snow, autumn 1926. Alf Clark photo courtesy of Don Clark. 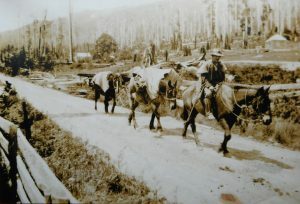 ‘on one occasion Old Tom had crossed Liverpool Street [Hobart] to test the quality of the liquor at the Alabama Hotel. A naval vessel was in port and there were quite a few sailors in the bar of the Alabama and Tom was getting somewhat more inebriated than usual. He finally reached the point of no return: he offered to fight anyone in the bar for £10 and threw a tenner on the bar to back himself. One of the naval chaps agreed to fight him so Tom demanded that his tenner be covered. However when he turned around there was no money on the counter and no one present would admit having touched it. Tom staggered back to the Brunswick [Hotel, on the opposite side of Liverpool Street] quite convinced that he had lost £20 not £10’. 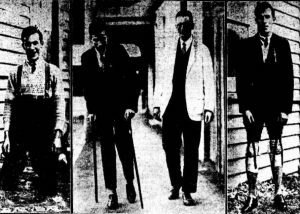 Hobart General Hospital records show that in 1926 Tom Stacey had sutures inserted in a cut in his face sustained while fighting at Adamsfield. His alcohol-fuelled lifestyle is easily traced today through digitised newspapers. Whatever money he made was soon spent, and he became the epitome of the old diehard prospector. In 1950 Tom Stacey was described as a 73-year-old ‘hermit’ living in a one-room shanty in the bush near Coles Bay, with only a dog for company. That dog hunted kangaroo meat, Old Tom had apple and cherry trees and grew vegetables to sell to guests at the nearby Coles Bay guesthouse. His bed was ‘a piece of sacking spread with fern’, and his ancient trousers were held together only by pieces of wire. 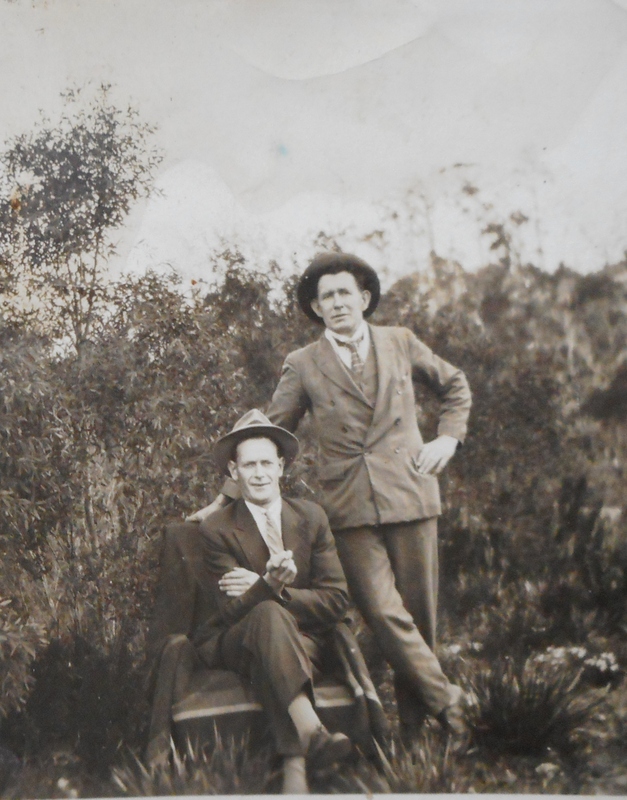 He was killed when hit by a car on the Tasman Highway near Sorell in 1954. Jim Stacey continued to prospect almost until his death in 1937. In 1935, for example, when he was 78 years old, he and two of his sons were paid by the government to spend ten weeks prospecting the Hastings–Picton River area. He died in the company of family and was remembered for his public service, not the least of which was leading the way to Adamsfield, where some gained a start in life and others scraped a living through the Great Depression. 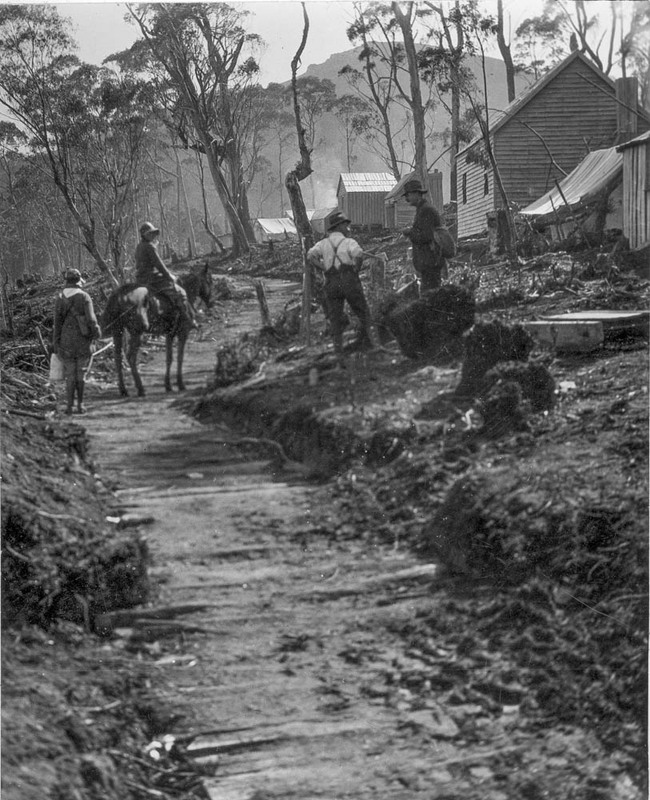 Stacey Street, Adamsfield, is overgrown by bracken fern, and Staceys Lookout on the Sawback Range, unvisited, but the twisted landscape of the mining field still recalls his skills, perseverance and vision. ‘Sudden death at Thomas Plains’, Launceston Examiner, 29 May 1878, p.2. RJ Stacey, ‘Exploring for minerals’, Mercury, 8 December 1907, p.6. The marriage on 18 February 1886 was registered at Emu Bay, no. 1266/1886. ‘Family notices’, Mercury, 2 June 1906, p.1. ‘The recruiting scheme’, Daily Post (Hobart), 17 February 1917, p.7; ‘Workers’ Political League’, Mercury, 21 December 1916, p.5. For the death of John Stacey, see ‘Tasmania: Nubeena’s avenue of honour’, Mercury, 5 November 1918, p.6. William Stacey joined E Company, in the New Zealand Army (see Nominal Roll, no.62, p.19, 1917). For his death see ‘Roll of honour: Tasmanian casualties’, Examiner, 12 November 1918, p.7. Thomas Albert Stacey and Robert Stacey were both wounded twice in France. Robert was also shell shocked. John Hutton to Sergeant Ward, 2 September 1916, SWD1/1/713 (TAHO). Note added to Police Gazette (Hobart), 12 January 1917, p.10. ‘Osmiridium: reported discovery’, Advocate, 8 September 1924, p.2. ‘Register of osmiridium buyers’ returns of purchases, September 1922–October 1925’, MIN150/1/1 (TAHO). ‘Mining reward: discovery of osmiridium’, Examiner, 20 December 1934, p.7. PB Nye, The osmiridium deposits of the Adamsfield district, Geological Survey Bulletin, no.39, Department of Mines, Hobart, 1929, p.3. ‘Osmiridium: Tasmania’s unique position’, Mercury, 29 September 1925, p.9. ‘Romance of Adams River’, Examiner, 25 December 1925, p.5. ‘Register of osmiridium buyers’ return of purchases’. For the trials and tribulations of Edith Stacey and her four children, see file SWD1/1/713 (TAHO). For Tom Stacey’s battles with liquor laws, see, for example, ‘Police Court news’, Mercury, 13 August 1927, p.3. Convicted of sending a child to buy alcohol for him, Stacey took six years to pay the small resulting fine (Police Gazette, 6 October 1933, p.204). Bert Farquhar, Bert’s story, Regal, Launceston, 1990, p.3. Horace Arnold ‘Jimmy’ Lane, I had a quid to get, the author, Stanley, 1976, p.63. ‘Register of applications for treatment, Outpatients Department’, Hobart General Hospital, 11 September 1926, HSD130/1/3 (TAHO). ‘A solitary bushman’, Examiner, 16 September 1950, p.7. ‘New clue found to hit-run motorist’, Mercury, 25 August 1954, p.5. Nubeena’, Mercury, 5 January 1938, p.9.